"This research expands our knowledge on the transition to agriculture in Mesoamerica," Pohl said. "These are significant new findings that fill out knowledge of the patterns of early farming." A Florida State University anthropologist has new evidence that ancient farmers in Mexico were cultivating an early form of maize, the forerunner of modern corn, about 7,300 years ago—1,200 years earlier than scholars previously thought. The results of Pohl's study, which she conducted along with Dolores R. Piperno of the National Museum of Natural History in Washington, D.C. and the Smithsonian Tropical Research Institute in the Republic of Panama, Kevin O. Pope of Geo Arc Research, and John G. Jones of Washington State University, are published in the April 9-13 edition of the journal, Proceedings of the National Academy of Sciences. "This research expands our knowledge on the transition to agriculture in Mesoamerica," Pohl said. "These are significant new findings that fill out knowledge of the patterns of early farming. It expands on research that demonstrates that maize spread quickly from its hearth of domestication in southwest Mexico to southeast Mexico and other tropical areas in the New World including Panama and South America." The shift from foraging to the cultivation of food was a significant change in lifestyle for these ancient people and laid the foundation for the later development of complex society and the rise of the Olmec civilization, Pohl said. The Olmecs predated the better-known Mayans by about 1,000 years. "Our study shows that these early maize cultivators located themselves on barrier islands between the sea and coastal lagoons, where they could continue to fish as well as grow crops," she said. During her field work in Tabasco seven years ago, Pohl found traces of pollen from primitive maize and evidence of forest clearing dating to about 5100 B.C. Pohl's current study analyzed phytoliths, the silica structure of the plant, which puts the date of the introduction of maize in southeastern Mexico 200 years earlier than her pollen data indicated. It also shows that maize was present at least a couple hundred years before the major onset of forest clearing. Traces of charcoal found in the soil in 2000 indicated the ancient farmers used fire to clear the fields on beach ridges to grow the crops. "This significant environmental impact of maize cultivation was surprisingly early," she said. "Scientists are still considering the impact of tropical agriculture and forest clearing, now in connection with global warming." The phytolith study also was able to confirm that the plant was, in fact, domesticated maize as opposed to a form of its ancestor, a wild grass known as teosinte. Pohl and her colleagues were unable to make the distinction after the pollen study. Primitive maize was probably domesticated from teosinte and transported to the Gulf Coast lowlands, where it was cultivated, according to Pohl. The discovery of cultivated maize in Tabasco, a tropical lowland area of Mexico, challenges previously held ideas that Mesoamerican farming originated in the semi-arid highlands of Mexico and shows an early exchange of food plants. Pohl's PNAS article also addresses misconceptions about the paleoecological method, which recovers microfossil evidence, such as pollen, starch grains, or phytoliths, as opposed to macrofossils or whole plant parts, such as maize cobs. Pohl and her colleagues argue that contamination of samples through the geological processes of sediment mixing is more likely to occur with macrofossils than microfossils. 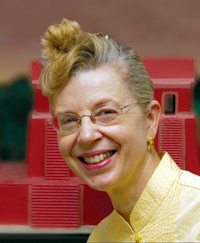 The National Science Foundation and the Foundation for the Advancement of Mesoamerican Studies funded the research.